Tangled and True: baby bean vintage daywear. I was tipped off by my friend Tracey about this dress I had to have at a little boutique downtown. Well it turns out she was right. I did have to have it, and I must say I am pleased with the results (above, I don't normally post the girls, but with these photos how could I not?). A new favorite has been born. You better believe my girls will be outfitted in baby bean vintage from here on out (or until they grow out of it). Each collection is made from or inspired by true vintage fabrics, they are handmade and truly one-of a kind. I love the pairing of vintage fabrics with simple and modern silhouettes. It truly is clothing love. Wow - those are pictures of your daughter...it looks like a magazine spread. So lovely! Oh my goodness, your daughter is GORGEOUS! and the whole baby bean line is wonderful!! I have twin daughters who are still too little for those dresses, but it won't be long! I should buy now! :o) Love your blog! Wow, your friend has great taste! 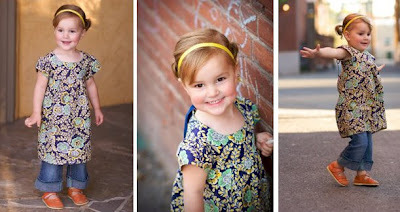 Love the dress, these pictures, that baby girl! She's so beautiful! Great photos! Oh and I love the name Stella too!